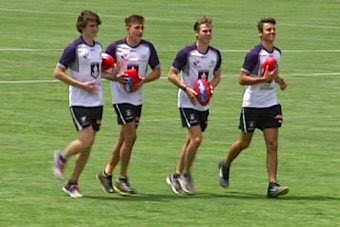 There was a common consensus from the Dockers four recruits as they took part in their first official training session on Monday morning - it is a surreal experience to be working under coach Ross Lyon. Lachlan Weller, Connor Blakely, Ed Langdon and Josh Deluca all officially became Fremantle players during Thursday's draft on the Gold Coast. Swan Districts midfielder Blakely said it was hard to believe he was now an AFL player. "I had to pinch myself at one stage when Ross Lyon was talking, and he was talking about the Hawthorn's and the Port Adelaide's (clubs), and I was sitting there thinking 'this is actually the AFL now'," he said. "It was a pretty big wake-up call that I'm actually here now," Blakely said. The Dockers took Subiaco premiership player Josh Deluca with their final selection in the draft. The forward believes the recruits will be given every opportunity to break into the side in their first AFL season. "What Ross has said ... [is] that once you are on a list you are on a list, it doesn't matter what pick you were," he said. Veterans Matthew Pavlich, Aaron Sandilands and Luke McPharlin all trained well on Monday morning in their first session of the preseason.